Overexploitation and pollution of water sources in India. Of the 200 countries where Coca-Cola is sold, India reportedly has the fastest-growing market, but the adverse environmental impacts of its operations there have subjected the parent company and its local bottlers to a firestorm of criticism and protest. There has been a growing outcry against Coca-Cola's production practices in India, which are draining out vast amounts of public groundwater and turning farming communities into virtual deserts. Suicide rates among Indian farmers whose livelihoods are being destroyed are growing at an alarming rate. Every day for years there has been some form of protest, from large demonstrations to small vigils, against Coca-Cola's abuses in India. Amit Srivastava addressing the Coca-Cola Board of Directors at the 2010 Shaholders Meeting in Duluth, Georgia. On Jan. 18, 2004, more than 500 protesters, including about 150 residents who live near Coke's bottling facilities in India, marched and rallied to condemn the company. At the time, according to Amit Srivastava of the India Resource Center, (For more information on Coca-Cola's crimes in India, go to the site of the India Resource Center.) "Three communities in India — Plachimada in Kerala, Wada in Maharashtra and Mehdiganj in Uttar Pradesh — are experiencing severe water shortages as a result of Coca-Cola's mining of the majority of the common groundwater resources around its facilities. Coke's indiscriminate dumping of waste water into the ground has polluted the scarce water that remains. In Sivagangai, Tamil Nadu, residents are opposing a proposed Coca-Cola facility because of fears that they too will face water shortages and pollution." "The Indian Parliament has banned the sale of Coke and Pepsi products in its cafeteria," Srivastava added. "The parliamentarians should take the next logical step, and ban the sale of Coke and Pepsi products in the entire country." He said the ban came as a result of tests by the Indian government and private laboratories which found high concentrations of pesticides and insecticides in the colas, making them unfit for consumption. "Some samples tested showed the presence of these toxins to be more than 30 times the standard allowed by the European Union. Tests of samples taken from the U.S. of the same drinks were found to be safe," he said. 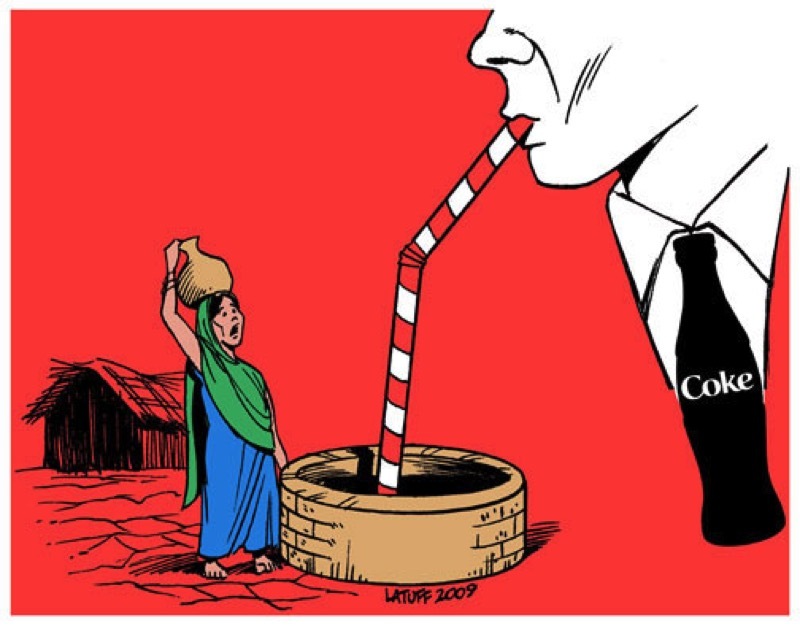 "It is only a matter of time before the Coca-Cola company will be held financially and criminally liable for their operations in water-stressed areas in India," Coca-Cola shareholders were told at the April 2010 shareholders meeting in Duluth, Georgia. "The company management is being seriously derelict in its duties by not acknowledging the real extent of the liabilities Coca-Cola has incurred and continues to incur in India,' said Amit Srivastava. 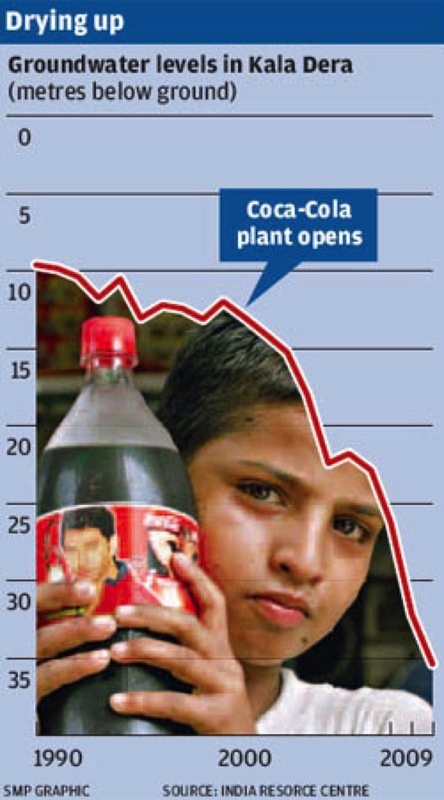 One of Coke's plants in India has been shut down since March 2004. The company's overexploitation and pollution of scarce water resources continue to spark large protests. And, as usual, Coke responds with public relations scams, deceptive statements and citations of phony awards. According to Coca-Cola in 2006, "For four consecutive years, Coca-Cola plants in India have won the prestigious Golden Peacock Environment Management Award for environmental practices from the Institute of Directors, which grants the award in association with the World Environment Foundation." Oddly enough, Coke at the time, didn't mention the fact that Sanjiv Gupta, president and CEO of Coca-Cola India, sits on the executive council of the Institute and that Coca-Cola contributes heavily to the World Environment Foundation. 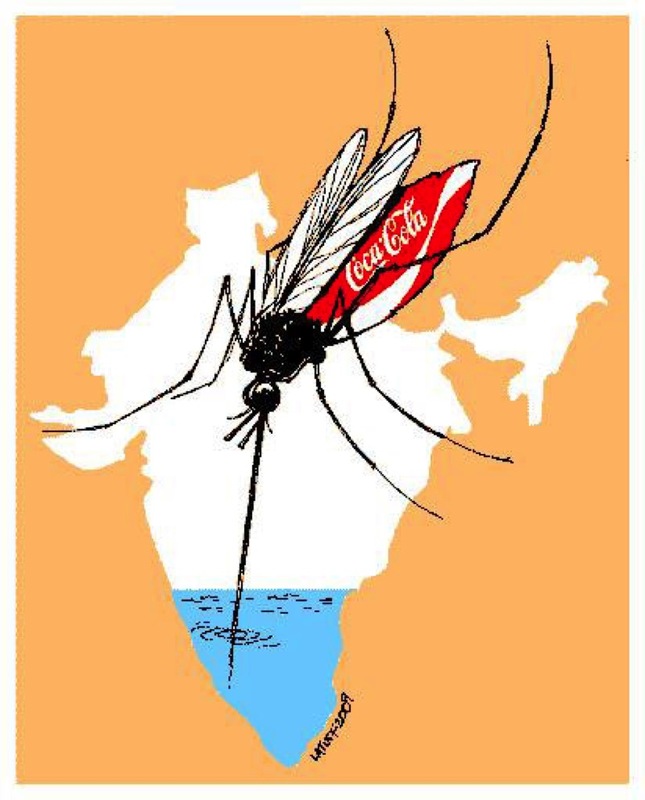 Coke also boasted: "In late 2005, the Confederation of Indian Industry (CII) recognized the Hindustan Coca-Cola Kaladera plant as a 'Water Efficient Unit' across industries at the National Awards for Excellence in Water Management." But Coke didn't disclose that Tarun Das, director-general of the Confederation of Indian Industry, serves on the International Advisory Council of The Coca-Cola Company. In 2007, at two Canadian college campuses, Coca-Cola continued spreading misleading information about its activities in India and Colombia. Coke boasted that The Energy and Resource Institute (TERI), described as "an Indian-based nonprofit research organization," had "begun an assessment of our company's water resource management practices in India" and would be 'working with an independent steering committee that will oversee the study..."
Months earlier, in April 2006, Coca-Cola's North American President Donald Knauss sent a letter to the University of Michigan's Chief Financial Officer, Tim Slottow, that said in part: "We are in active dialogue with TERI, a highly respected Dehli-based NGO with deep experience on sustainability issues to develop a transparent and impartial independent third party assessment of water resource management practices at Coca-Cola facilities in India..." Mr. Slottow immediately responded for the university: "...[We] are supportive of your work with The Energy and Resource Institute (TERI), a highly respected nonprofit organization with more than 30 years of experience and leadership on sustainability issues, to develop a transparent and independent third party assessment of water resource management practices at Coca-Cola bottling plants in India..."
It's simply amazing that any campus administrator, let alone the University of Michigan's CFO, could be duped into believing that TERI would be impartial or independent. After all, Coca-Cola India Ltd. was listed by TERI on its website as a corporate sponsor and TERI Governing Council member Deepak S. Parekh was on the Advisory Board of Coca-Cola India. At the time, at least two current projects of TERI were being sponsored by Coca-Cola India Ltd. The Centre for Science and Environment (CSE) issued a report of test results regarding unacceptable levels of pesticides in Coca-Cola and Pepsi Cola soft drinks being sold throughout India. The India Resource Center, reported that the study found high levels of lindane, a confirmed carcinogen, sometimes as high as 140 times those allowed by EU and BIS standards; chlorpyrifos, a neurotoxin, sometimes as high as 200 times those allowed by EU and BIS standards; heptachlor, which is banned in India and not used in the US since 1988, was found in 71% of samples, at levels 4 times higher than the proposed BIS standards; and malathion, a pesticide that was found in 38.6% of the samples tested. The U.S. Environmental Protection Agency recommends that workers wait at least 12 hours before entering an area where malathion has been applied. Coca-Cola tries to undercut the credibility of CSE's test results by raising questions about the accreditation of the CSE lab and the equipment and methodology it used. In the same breath, Coca-Cola says, "The methods used to test our finished products have been developed by the company and Central Science Laboratory (CSL), which is an independent laboratory used by the U.K. government. Although the validation of the methods has not been completed, they represent the state of the art in terms of procedure and technology. CSL runs an international program to test the proficiency of laboratories in analysis, including pesticides." To a corporate giant like The Coca-Cola Company, $2 million is insignificant pocket change - literally a drop in the ocean of money it extracts from the worldwide markets where its overpriced, often unhealthy beverages are sold. So, did Coca-Cola get its money's worth when it paid a New Dehli-based think tank $2 million for a "third-party assessment" of the environmental havoc it has wreaked in India? "From a PR standpoint, which has always been Coke's concern, it appears they did," said Ray Rogers, director of the Campaign to Stop Killer Coke. "At the same time, it confirms Coke's gross misconduct with water management problems and how they caused environmental damage they've been denying for years." The report by The Energy and Resources Institute (TERI), 16 months in the making, noted that while the plants it evaluated — only six of more than 50 Coke operates in India - may have met some government regulatory standards, most did not achieve the wastewater standards set by the company itself because of "presence of faecal coliform and several other physico-chemical pollutants in the treated wastewater." TERI ignored, for reasons never explained, the Coke bottling plant in Plachimada, Kerala, that has been shut down since March 2004 after massive protests by activists from surrounding farms and communities devastated by water scarcity and pollution. However, the report said a watershed at Kaladera, Rajasthan, where one plant is located, has been so "overexploited" that Coke should consider relocating the plant or shutting it down. Misleading headlines (like "Coke Makes Cleanup Gains" in The Wall Street Journal) helped Coke apply its PR spin to the TERI story, but no amount of glib interpretation can hide the fact that Coke continues to cause devastating local water shortages. The report notes, for example, that Coke's choices on where to site their plants are "strictly business" decisions that cause great distress to local communities. It bluntly states that "community water issues do not appear to form an integral part of the water resource management practices of The Coca-Cola Company." It even points out that the company hampered TERI's assessment by refusing to share the environmental impact assessments for any one of the six plants. Perhaps most noteworthy of all, it validates the main concerns of protestors about water scarcity and pollution. "In general, the community perceptions were found in conformity to the results obtained from the detailed technical assessment of groundwater resources," the report said. According to the Center for Science and Environment (CSE), headed by Sunita Narain, who won the 2005 Stockholm Water Prize, Coca-Cola could not be described as pesticide-free, because only the water had been tested and not the rest of the ingredients. A CSE statement said: "TERI has not tested the final product, which we drink. The CSE study in 2003 and 2006 tested bottles of colas and found pesticides above safe limits in the drinks." "Coke's ability to influence the timing and media analysis of the TERI report made it well worth the company's piddling $2 million investment," said Rogers. "They wouldn't pay two bucks for a report they couldn't see first and sanitize as much as they could." The University of Michigan and Coca-Cola agreed to commission the TERI report after students argued that Coke's water-management practices violated the university's code of conduct for vendors. UM was among the largest of more than 46 colleges and universities that removed Coke products from campuses because of flagrant corporate irresponsibility overseas, particularly in India and Colombia. "The bill stems from complaints against Coca-Cola surrounding a bottling plant in the village of Plachimada. Seven years ago, protesters accused the Atlanta-based company of pollution and water depletion. Coca-Cola closed the plant in 2004." "New Delhi: The state government of Kerala in India has approved a draft Bill to set up a tribunal which will allow individuals adversely affected by Coca-Cola's bottling operations in Plachimada to seek compensation from the company. The state government is expected to introduce the Bill in the state legislature next week, and the Bill is expected to pass. "The decision to introduce the Bill to set up a mechanism to hold Coca-Cola financially accountable for the damages it has caused is a very significant move by the state government of Kerala. The passage of the Bill by the state legislature will formalize the state government's position that Coca-Cola is responsible for causing environmental damages in and around its bottling plant in Plachimada in the state of Kerala, and that the company must pay for the damages it has caused." 'The report by TERI is a damning indictment of Coca-Cola's operations in India. The report takes the company to task for siting its bottling plants in already water stressed areas, without much thought given to the impacts on communities. The report also validates the concerns of water scarcity and pollution that have been raised by communities in Kala Dera, Mehdiganj as well as others. A list of Coca-Cola's shortcomings, according to the report, follows this press note." "He [R. Ajayan ofThe Plachimada Samara Aikyadartya Samithi] said Coca-Cola's decision to get a 'third party study' done by an institution that 'enjoyed its sponsorship' had created a lot of protest in the country. Even so, the report of the Delhi-based TERI, released on Tuesday, did not give the company a clean certificate as was being made out by 'propagandists.'" "A leading environmental research group based here has asked Coca-Cola to consider shutting down a bottling plant in the drought-stricken state of Rajasthan, saying that the plant is depleting scarce water supplies." "In a major blow to the Coca-Cola company in India, a report by its ally, the Energy and Resources Institute (TERI), has called for the closure of one of its bottling plants in India - in the village of Kala Dera in the state of Rajasthan. Citing the widespread water shortages being experienced by villages around Coca-Cola's bottling plant, the report by TERI recommends that either the Coca-Cola bottling find alternative sources of water - a highly impractical option - or either relocate or shut down the plant altogether." "In a statement here, council convenor R Ajayan said TERI's 500-page report had not made any suggestion of a clean chit, though the report was an attempt to hide certain facts and `whitewash' the company's operations. "The Plachimada Coke plant, which could not operate for the last four years following locals' agitation was left out from the purview of the study. The report was silent on why the plant at Plachimada and the one at Ballia in Uttar Pradesh had to suspend their operations. "The Coca-Cola company's attempt to regain its lost credibility had once again failed, Ajayan said. The company should explain to the people why Plachimada was not included in the study conducted by TERI, he added." We received an email from S. Faizi, environmental expert on the committee that wrote this report: "The Report of the High Power Committee to Assess the Extent of Damages Caused by the Coca Cola Plant at Plachimada and Claiming Compensation was submitted to the govt of Kerala today. We have gathered impeccable evidence to show the depletion and pollution of groundwater caused by the company...The multidisciplinary, 14-member committee was set up by the Kerala govt. in April 2009. It was chaired by the Additional Chief Secretary Mr K Jayakumar and included heads of various depts. I was its environment expert member. Early in the course of the Committee's work Coca-Cola had sent us a threatening letter which we had chosen to ignore." "The deterioration of groundwater in quality and quantity and the consequential public health problems and the destruction of the agricultural economy are the main problems identified in Plachimada. The activity of the Coca Cola company has caused or contributed a great deal to these problems. The people living in the vicinity of the Company have been suffering these problems for the last few years. The availability of good quality water for drinking purposes and agriculture has been affected dangerously due to the activity of the Company. Apart from that, the Company had also polluted the agricultural lands by depositing the hazardous wastes. All these points to the gross violation of the basic human rights, that is, the right to life, right to livelihood and the violation of the pollution control laws." According to media reports and a press release from the India Resource Center, "In a major step towards holding Coca-Cola accountable for damages it has caused in India, the state government of Kerala decided on Wednesday to move forward with the formation of a tribunal that will hear and award compensation claims against The Coca-Cola Company. "The Kerala state cabinet's decision is based on the report and recommendations of a High Power Committee which released a report on March 22, 2010 holding Coca-Cola responsible for causing pollution and water depletion in Plachimada in the state of Kerala in south India. "Using the 'polluter pays principle', the High Power Committee had recommended that Coca-Cola be held liable for Indian Rupees 216 crore (US$ 48 million) for damages caused as a result of the company's bottling operations in Plachimada. "The Coca-Cola bottling plant in Plachimada has remained shut down since March 2004 as a result of the community-led campaign in Plachimada challenging Coca-Cola's abuse of water resources. "The report noted that the suggested figure of $48 million was "indicative in nature" and "should not be treated as the outer limit of compensation." The report also stated that the 'actual compensation will have to be calculated by an Authority duly set up for this purpose.' "
Three officials of an Indian unit of Coca-Cola have been arrested over the deaths of at least two workers at a soft drinks bottling plant in the east of the country, police said on Sunday. The accident occurred Friday in Khurda town, just south of Orissa state capital Bhubaneswar, when a boiler exploded at the plant, police said. Two workers died in the accident while five were seriously injured, police superintendent Jitendra Patra said. Local media reported a third worker had also been killed, but Patra said he could not confirm the death. He said police had arrested three officials from the plant on suspicion of negligence in connection with the accident. He would not identify the officials. A team from the Orissa government's labour ministry was also investigating the accident. 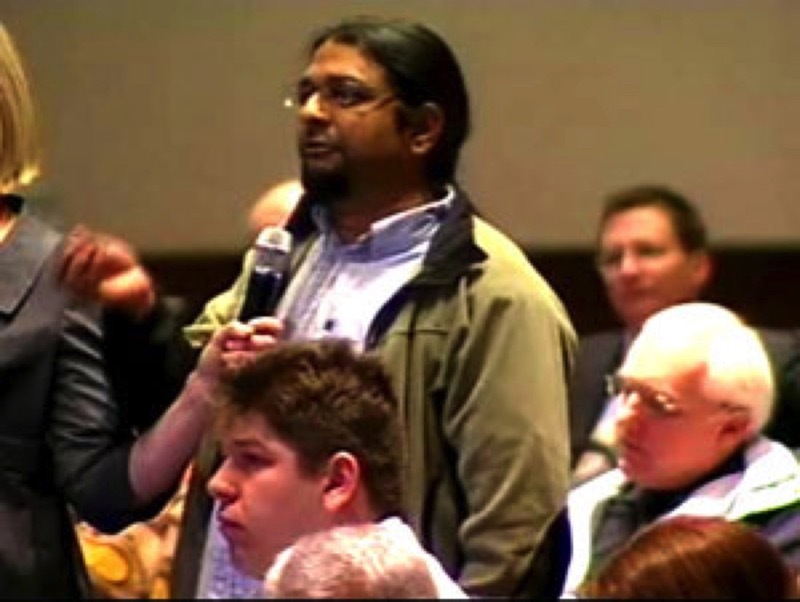 "We are awaiting the report of the boiler inspector," Patra said. Officials of Hindustan Coca-Cola Beverages Private Ltd declined to comment. For information on Coca-Cola's crimes in India, go to the site of the India Resource Center at www.indiaresource.org.